Most marine mammal species spend the majority of their lifetime at sea… underwater. Some species (like sperm whales, beaked whales, and elephant seals) can go routinely as deep as 1000m below sea level. To mammals like us, these incredible depths seem uninhabitable. It’s cold, dark, under high pressure (100kg/cm²) and 1km from air! Yet deep-diving marine mammals thrive there and have colonized every deep ocean on the planet. They have developed amazing capabilities for that purpose – including efficient swimming, an advanced auditory system, sonar (in some cases), thermal insulation, extreme breath holding abilities and resistance to high pressure. Spending most of their time at depth makes them quite difficult to study. And we have a lot of questions to ask them. How do they balance swimming cost versus food intake? Do they forage cooperatively, in groups? For those with sonar, how does it work? With increasing human activities (oil exploration, military sonar, sea transport, fishing etc.) an important new question arises: how do they cope with us? To help answer these questions, scientists have developed two broad categories of methods to accompany marine mammals into the abyss: passive acoustics and archival tags. Both approaches provide rich and complementary information on animal behavior. 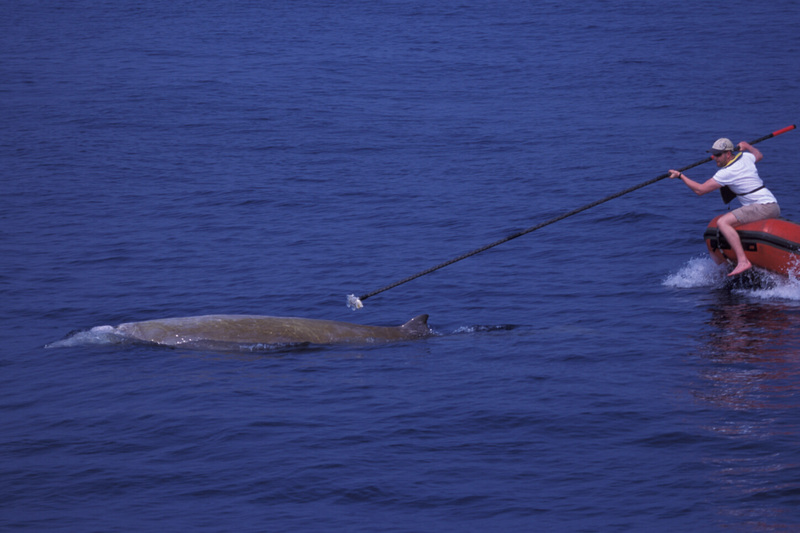 Tagging consists of attaching a ‘logger’ with several high-tech sensors to the animal’s back. The sensors might include a 3D-accelerometer and 3D-magnetometer, a pressure sensor, hydrophones and a GPS receiver to name just a few. The data that we receive from these archival tags lead to new insights on marine mammal behavior. Electronic tagging provides a new window into the murky depths of the oceans, allowing inferences even when the animals themselves are silent. Knowing where animals are over time allows additional insights too: for example 3D-position allows researchers to quantify received sound levels from an external source (i.e. not the tagged animal) at the animal’s location, and directly evaluate their effect on the animal’s behavior. Accelerometer data are too noisy to get useful information on animal displacement through numerical integration. The accelerometer is instead used to measure the 3D-orientation of the Earth’s gravitational field relative to the tagged animal. We can work out the 3D-orientation of the animal by combining acceleration data with data from the 3D-magnetometer (which measures the 3D-orientation of the Earth’s magnetic field). The pressure sensor provides information on animal depth. Depth differences at two consecutive time steps let us know how fast the animal is going vertically. Vertical speed combined with 3D-orientation gives us the animal’s location and direction in three dimensions. This could be deduced by naïve ‘dead reckoning’ – joining together successive speed and direction starting at the last known location on the surface – but this process quickly becomes very inaccurate. The reason for this is that even minor measurement errors cause errors on 3D-orientation and speed. Errors accumulate, which can lead rapidly to flying marine mammals! To make things even more complicated, information from the depth-meter on animal speed reaches zero when the animal moves horizontally (speed is not detected from the depth-meter since the animal stays at the same depth) and this leads to even larger errors. Noise is not always a bad thing! Typically ‘noise’ is a plague that lowers the quality of the data and of the reconstructed track. There are different sources of noise, such as vibrations due to water flowing past the tag that make accelerometer and magnetometer data noisy. Such vibrations also make acoustic data noisy; which turns out to be really helpful! Speed can be inferred from the noise of the water flowing past the hydrophones, in the same way that airflow noise past a car tells you something about its speed. Information on the 3D-orientation of the animal from the tag relies on the correct calibration of the tag orientation on the animal’s back. Information on animal speed from flow noise also relies on the correct calibration of a noise-speed relationship. Both calibrations need to be triple-checked and any errors should be incorporated and properly accounted for in the track estimation. Another difficulty originates from the fact that this method uses multiple sources of information, which can sometimes be contradictory. As we said earlier, animal 3D-orientation and depth provide information on animal speed, as does the flow noise. But which one should we rely on? Both are valuable sources of information and should be accounted for in the data fusion process. Speeds from these two sources of information are, however, sometimes considerably different. Is this solely due to ‘noise’? The data presented in ‘Tracking marine mammals in 3D using electronic tag data‘ clearly shows the animal we have been tracking can move deeper while facing towards the surface! We have therefore allowed for this in the tracking process by leaving the possibility that the animal can travel in a direction which is different from what the orientation of its body suggests. The tracking procedure allows the direction of the movement (grey arrow) to differ from the animal’s orientation (black arrow). Pitch anomaly (color) is the difference between these directions. At two occasions, the whale moves downwards (decreasing depth) while being oriented upwards. … Except for the fact that we can also use our prior knowledge about the model parameters to help with the modelling. We can do this using Bayesian statistics, where the a priori information (in the form of prior distributions on model parameters) can be included together with formal data in the modelling. We therefore implemented our movement model with a Bayesian language (BUGS). Our approach could still be implemented with alternative tools (eg. Kalman filters). Essentially only implementation would differ, while model, questions and results would be similar. The point is that tracking is not just data processing. There are always latent assumptions that can be made explicit through a model. We have reconstructed the 3D-track of the deep dive of a beaked whale. And the good news is that localization results, produced from an independent passive acoustic study, are in agreement and closer to our results than to earlier attempts. Our new method does indeed seem to help improve the knowledge we can gain from animal tag data about the path that animals take through the abyss. Reconstructed 3D-track of a 51’20” deep dive of a Blainville’s beaked whale (one frame per minute). The whale covered a total curvilinear distance of 5170 m. Color is pitch anomaly. Using these methods, we are able to learn a lot of new things about deep-diving marine mammals. Fitting tracks improves our knowledge on movement statistics (eg. acceleration, rotational speed) that can be used later to refine movement models. Marine mammal do not move like torpedoes! Archival tags enabled us to detect and model complex movements. We can see a bit further into the abyss and we’re getting closer to being able to answer those questions that we posed at the start of this post. For example, a series of ‘controlled exposure experiments’ are investigating the response of tagged animals to human-caused ocean sounds. For research to continue to move forward we need to pursue our efforts on 3D-tracking and data processing by combining all information available and pushing the limits of archival tags, passive acoustics and movement models. There is still a lot of overlooked information on marine mammal movement concealed in tag and passive acoustic recordings that is just waiting to be discovered. To find out more about Electronic Tagging, read ‘Tracking marine mammals in 3D using electronic tag data‘ by Christophe Laplanche et al. This paper is part of our Wildlife Monitoring Virtual Issue. *Passive acoustic monitoring can also be used to track terrestrial species. You can find out more about this in yesterday’s blog post from Ammie Kalan. This entry was posted in Conservation and management, Methods papers, Practical methods in the field, Virtual Issues and tagged 3D-Accelerometer, 3D-Magnetometer, 3D-Tracking, Archival Tags, Bayesian Statistics, Dead Reckoning, Deep-Diving Marine Mammals, Electronic Tag, Electronic Tag Data, Elephant Seals, Hydrophone, Marine Mammals, Movement Models, Tagging, Undersea Tracking, whales by Chris Grieves. Bookmark the permalink.